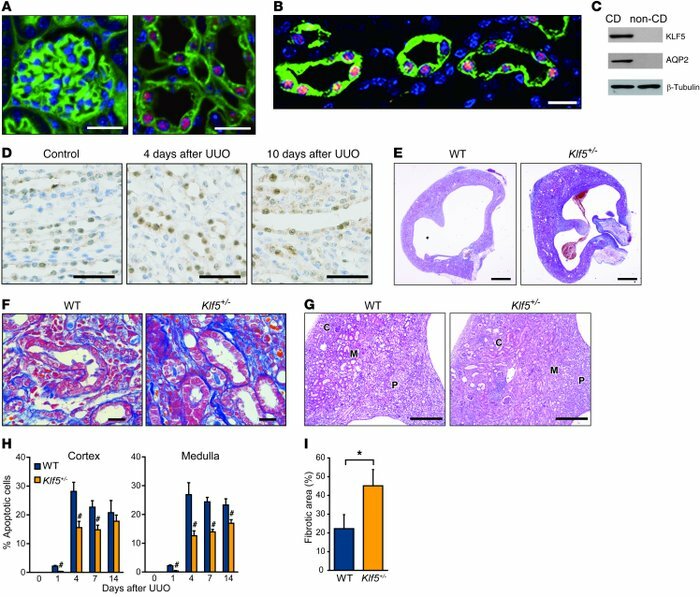 KLF5 is involved in UUO-induced renal injury. (A) Immunohistochemical staining of KLF5 (red) in mouse kidneys. Left and right panels show portions of the cortex and medulla, respectively. Nuclei and cell membranes were stained using DAPI (blue) and wheat germ agglutinin (green), respectively. Scale bars: 20 μm. (B) KLF5 expression was confined to AQP2-expressing collecting duct cells in papilla. KLF5 (red), AQP2 (green), and nuclei (blue) are shown. Scale bar: 20 μm. (C) Expression of KLF5 protein in the collecting duct. Collecting duct (CD) cells were isolated from kidneys by centrifugal separation. The remaining renal cells were non-CD cells. β-Tubulin served as a loading control. (D) UUO-induced upregulation of KLF5 in the collecting duct. KLF5 (brown) was detected by immunostaining of sections of medulla under basal conditions (control) and at the indicated times after UUO. Scale bars: 50 μm. (E–G) Masson’s trichrome (E and F) and H&E (G) staining of wild-type and Klf5+/– kidneys 14 days after UUO. C, cortex; M, medulla; P, papilla. Scale bars: 1 mm (E), 20 μm (F), 500 μm (G). (H) Apoptotic cell fractions in kidneys from wild-type and Klf5+/– mice at the indicated days after UUO. Apoptotic cells were analyzed by TUNEL staining, as shown in Supplemental Figure 3A. #P < 0.05 versus wild-type at the same time point. n = 6. (I) Fibrotic area stained with picrosirius red 14 days after UUO. *P < 0.05. n = 6. Representative sections are shown in Supplemental Figure 3C.